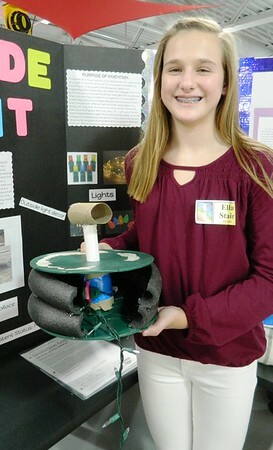 NEWINGTON - Professional engineers in town judged the genius of 10- to 14-year-old inventors this month. 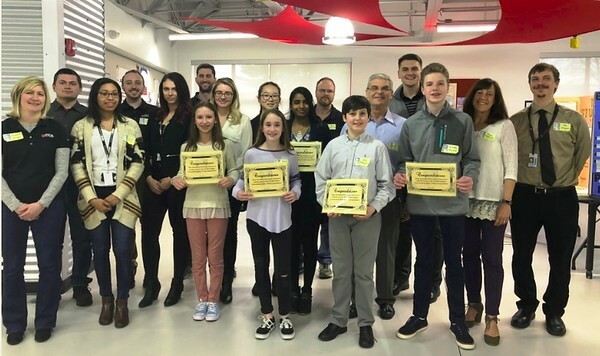 Youths from John Wallace and Martin Kellogg middle schools presented useful products they designed at the 2019 Newington Middle School Invention Convention, held at John Wallace. 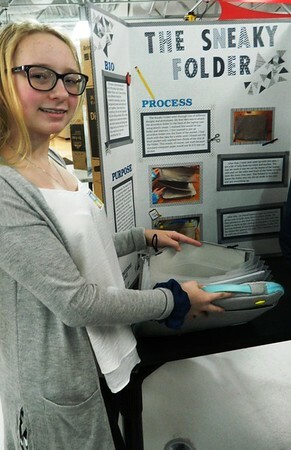 Six students were selected to advance to the Connecticut Invention Convention this spring at the University of Connecticut. Finalists will compete at nationals in Michigan at the end of May. JWMS science teacher Jess Morin was “phenomenally proud” of her seventh- and eighth-grade classes from the school’s Academy of Aerospace & Engineering. Engineering professionals from PCX Aerostructures at 300 Fenn Road and GKN Aerospace at 183 Louis St. visited the school to examine and judge the inventions. PCX programmer Saban Becirovic was impressed to meet the future leaders of his industry. “It’s a good feeling knowing what type of talent is hopefully going to be coming down the line in the next ten years or so,” he pointed out. 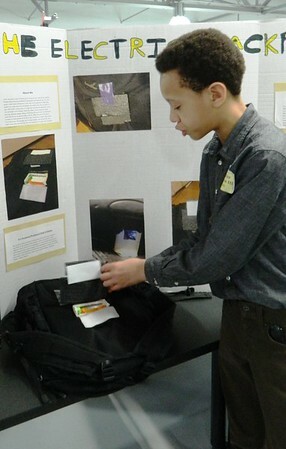 Students worked on their products about two hours per week in school and spent extra time on them at home. The academy wing provides them with state-of-the-art technology, tools and equipment including a 3-D printer. 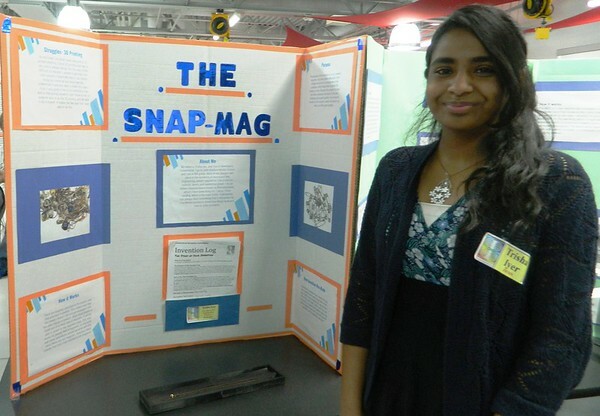 Iyer encountered a problem while traveling that led to her creating The Snap Mag, a carrying case that keeps metal jewelry from tangling through the use of magnetic strips. It was a common summertime woe that inspired Johnson’s creation, The DuraSleeve. Students’ presentations displayed their preliminary drawings and bullet points on the design process, from material choices to marketability. Each presented a prototype model of their product to the judges. 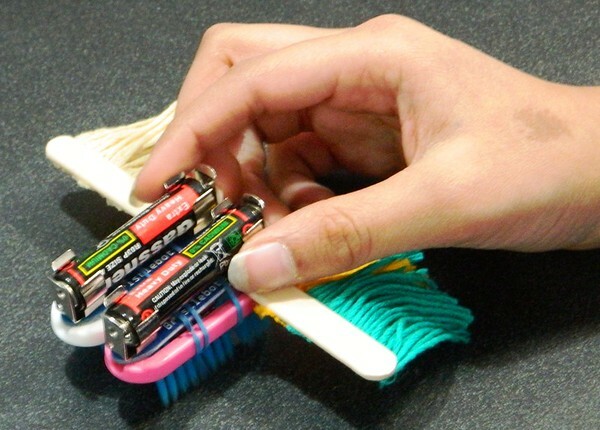 Spencer Peterson III’s “Electric Backpack” transports a mobile phone and charges its battery. 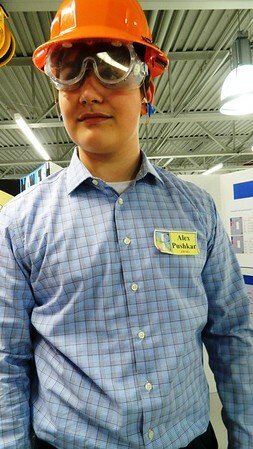 Alex Pushkav’s “Hard Hattaratus” is a hard hat, safety goggles and ear plugs all in one. Ella Stair’s “Loop de Light” is a spool on which to wind up Christmas lights. 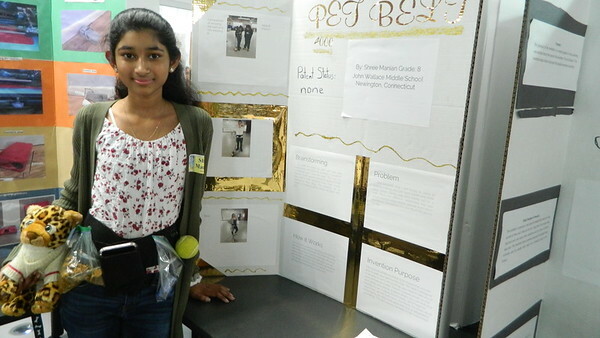 Shree Manian’s “Pet Belt 4000” combines all the supplies a dog owner might need on a single strap around their waist – a tennis ball, plastic bags, treats, phone pouch and leash hook. Posted in Newington Town Crier, Newington News on Thursday, 21 March 2019 09:04. Updated: Thursday, 21 March 2019 09:07.